The Art of Memoir is just over 200 pages long, including a 6-page, densely-packed reading list* (always exciting, and intimidating!). 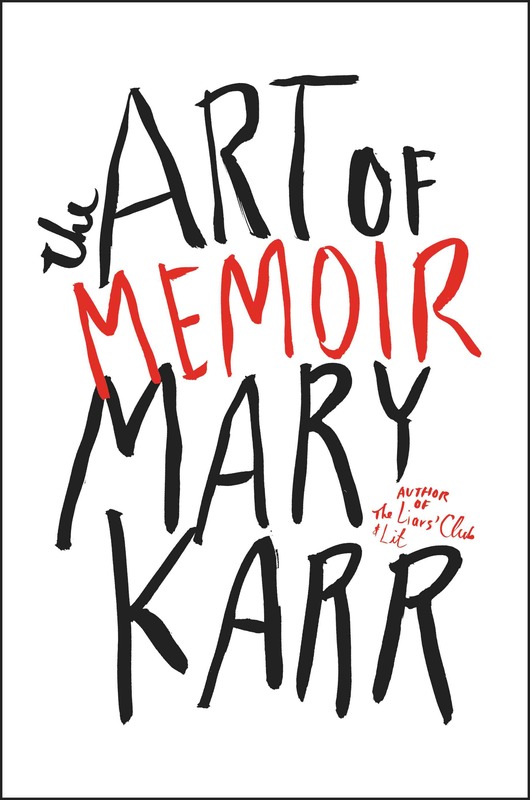 It begins with Karr’s “Caveat Emptor,” a disclaimer in which she writes, “no one elected me the boss of memoir.” One of the recurring concepts in this book is Karr’s reluctance to take up the mantle of expert; but she does acknowledge her “fifty-plus years of reading every memoir I could track down and thirty teaching the best one (plus getting paid to bang out three)”. She then takes us through a study of some of her favorite memoirists–Nabokov, Harry Crews, Maxine Hong Kingston, Kathryn Harrison, Michael Herr–and, with apologies (“if I didn’t have to pay out the wazoo to quote from better books than my own, I’d have way more Nabokov in here”), her own work. She offers chapters with titles like “Why Not to Write a Memoir” and “How to Choose a Detail,” and focuses on carnality (“sensory impressions, not sexual ones”), lies, individual talents, how to deal with loved ones, blind spots and false selves, exaggeration, and so much more. Unsurprisingly, she places early and heavy significance on the subject of voice, and there may be no writer more qualified. It’s one of the things Karr does best, in my opinion. At the time I came across A Childhood, I was an academically uncredentialed former redneck Texan trying to pass myself off as a poet in hyperliterary Cambridge. Crews had lost time trying to hide his own cracker past, and then he’d written about that milieu in a book that would serve as my lodestar. How good it is, I can no longer gauge. But it helped to guide me out from my biggest psychological hidey-holes. Reading Crews, I found the courage to tell the stories I’d been amassing my whole life. I include so much of him here to underscore how mysterious a single influence can be if he shares a novice’s foibles. Were I a tattoo-getting individual, I’d owe him some fleshly real estate. That kind of enthusiasm is catching, of course, and I was convinced to go straight to Crews; in fact, I had to put this book down to read that one (for reasons of school schedules). In case you missed my review of that book, here it is. And directly after, I turned back to Karr for a reread of The Liars’ Club. (Fresh review coming up on Friday.) I have yet to find my way to her acclaimed memoirs Cherry and Lit, but I think they’ll be on the list. Like the best craft books, this one makes good reading in itself. * It’s not a manual. Karr’s personality on the page is worth spending time with, and she makes the appreciation of good writing more accessible. She writes for general readers (and warns them, when things are about to get technical, that they might skip the next few pages). There are also passages specifically for writers: a list of “old-school technologies for the stalled novice,” for example, that does not rely on writing exercises. In short: there is much to love here. Not least, Mary Karr herself. *These are all things I could have written about Stephen King’s On Writing as well, and they would have been equally true. It’s no coincidence that I enjoyed both of these books. If you like one, do go find the other.